CodeMeter technology as a practicable system prototype on the production line of SmartFactoryKL. With a mission to develop an integrated security concept for the protection requirements of industrial enterprises, the German companies “German Research Center for Artificial Intelligence (DFKI)” and WIBU-SYSTEMS AG have launched an intensive co-operation strategy. Together they are researching suitable protection mechanisms against a number of different threats, and developing adequate defense solutions to be implemented in a system prototype for the production line of the SmartFactoryKL of DFKI. Industrial companies will then be facilitated in the adoption of intelligent production technologies, fully embracing the “INDUSTRIE 4.0” era in a secure way. Both research partners bring their own competences to the table. 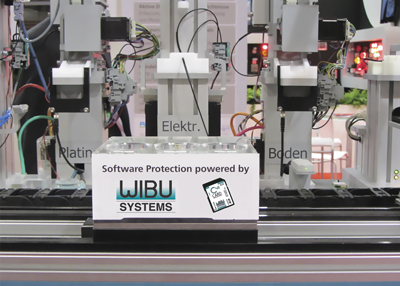 Wibu-Systems is responsible for the adaptation and extension of the protection technology CodeMeter, so that RFID tags can be used as a protection hardware alternative to CmDongles, and the authorization and right allocation can be executed via software. DFKI will develop an integrated security concept and setup the production line for the testing and evaluation of the security technologies. The protection concept will be flexible, retrofitted in existing production systems and it will repress potential manipulation attacks, unauthorized activations, know-how thefts and illegal imports of new software. Prof. Dr. Wolfgang Wahlster, CEO DFKI, emphasizes the importance of the topic: "With INDUSTRIE 4.0, the Internet of Things finds its way into the factories. In order to use the advantages of cyber-physical production systems unaffected by external threats, Security by Design should play a central role already during the planning phase. This is the only way that would exclude sabotage and industrial espionage."